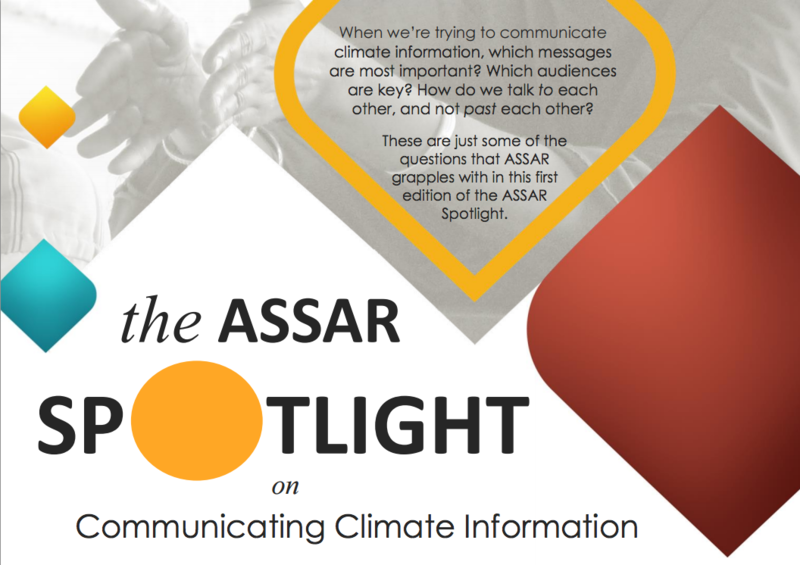 We have just published the very first ASSAR Spotlight! In these differently-themed and zippy quarterly publications the ASSAR (Adaptation at Scale in Semi-Arid Regions) project team members recount their experiences, insights and lessons-learned. This time around, our Spotlight focuses on communicating climate information. In it we grapple with increasingly relevant topics, such as which climate messages are most important, which audiences are key and how we can all talk to each other, rather than past each other. This edition includes guidance on why and how "we should just talk to each other", articles reflecting on the challenges of climate communication in Southern Africa, East Africa, West Africa and South Asia, the complexity of using climate information in decision making (based on learning from ASSAR's Climate Training School), and the usual opportunities and events updates. Click here to download the entire Spotlight (or use the download provided in the right-hand column). You can also flick through this edition of ASSAR Spotlight in the SlideShare below.